On the southern point of the Palos Verdes peninsula overlooking San Pedro Bay rise the 100 foot cliffs of Point Fermin. In 1869 California’s first railroad from San Pedro Bay to Los Angeles was completed. Local businessman immediately petitioned the Lighthouse Board to build a lighthouse to mark the harbor due to the increase in shipping to the growing port. In 1872 Congress appropriated monies for the project and a site was chosen for the lighthouse reservation, however delays in obtaining title to the land delayed construction. In 1874 redwood from northern California was landed and hauled up the cliffs to the building site. 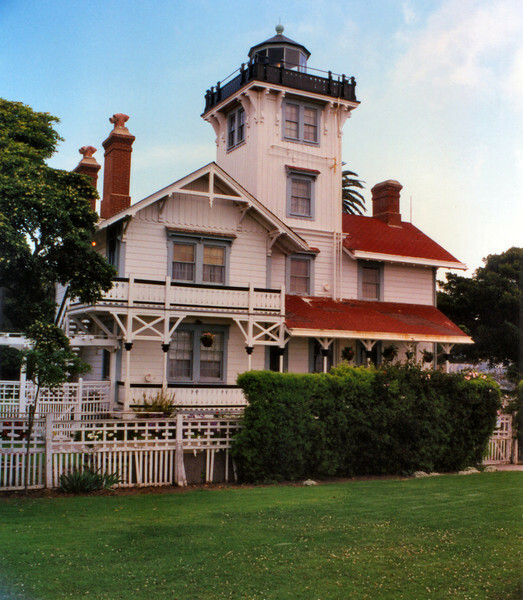 One of the Lighthouse Board’s best architects, Paul J. Pelz, was chosen to prepare the plans for the Point Fermin Light. Pelz had designed the St. Augustine Light in Florida as well as the Library of Congress as well. The design he produced was a beautiful Victorian stick-style home topped by a lantern. The same design was also used for lights to be constructed at Port Huenene in Oxnard, California and Hereford Inlet, New Jersey.